Sima Qian (c. 145 B.C.E. – 90 B.C.E.) was a prefect of the Grand Scribes of the Han dynasty. He is regarded as the father of Chinese historiography because of his highly praised work, Shiji ("History Record"), an overview of the history of China covering more than two thousand years from the Yellow Emperor to Emperor Han Wudi. His work laid the foundation for later Chinese historiography. Sima Qian’s style of writing was easy to read, full of humor and, less formal than most classical language, his history was therefore accessible to a wide readership. The text is regarded as one of the most significant texts from the Han period. Knowledge was thus made available at a popular level, assisting the process of democratization of learning in China where civil service largely depended on merit and on scholarly accomplishment, not on nobility of birth or ability to purchase a public appointment. Sima Qian's contribution to historiography included an emphasis on the human element in history rather than attributing all events to supernatural causes, which was a departure from tradition. Sima Qian was born and grew up in Longmen, near present-day Hancheng, Shaanxi. He was raised in a family of historiographers. 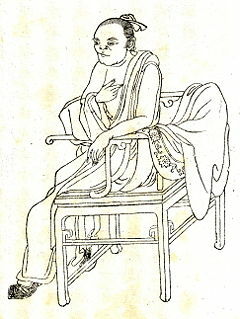 His father, Sima Tan, served as the prefect of the Grand Scribes of Emperor Han Wudi. His main responsibilities were managing the imperial library and calendar. Under the influence of his father, at the age of ten, Sima Qian was already well versed in old writings. He was the student of the famous Confucians Kong Anguo and Dong Zhongshu. At the age of twenty, with the support of his father, Sima Qian started a journey throughout the country, collecting useful first-hand historical records for his main work, Shiji. The purpose of his journey was to verify the ancient rumors and legends and to visit ancient monuments, including the renowned graves of the ancient sage kings Yu and Shun. Places he had visited include Shandong, Yunnan, Hebei, Zhejiang, Jiangsu, Jiangxi and Hunan. After his travels, he was chosen to be the palace attendant in the government, whose duties were to inspect different parts of the country with Emperor Han Wudi. In 110 B.C.E., at the age of 35, Sima Qian was sent westward on a military expedition against some "barbarian" tribes. In 110 B.C.E., Sima Tan fell ill for not being allowed to attend the Imperial Feng Sacrifice. Suspecting his time was running out, he summoned his son back to carry on the family tradition, that is, to complete the historical work he had begun. Sima Tan had the ambition to follow the Annals of Spring and Autumn (the first chronicle in the history of Chinese literature). Therefore, from 109 B.C.E., Sima Qian started to compile Shiji and inherited his father's inspiration. In 105 B.C.E., Sima Qian was among the scholars chosen to reform the calendar. As a senior imperial official, Sima Qian was also in the position to offer counsel to the emperor on general affairs of state. In 99 B.C.E., Sima Qian got involved in the Li Ling Affair. Li Guangli and Li Ling, two military officers, were ordered to lead a campaign against the Xiongnu in the north. Having been defeated and taken as captives, Emperor Han Wudi attributed the defeat to Li Ling. While all the officials in the government condemned Li Ling for the defeat, Sima Qian was the only person who defended Li Ling, who had never been his friend but whom he respected. Emperor Han Wudi thought Sima Qian’s defence of Li Ling was an attack on Wudi's brother-in-law who was fighting against Xiongnu without much success. Subsequently, he was sentenced to death. At that time, execution could be replaced either by money or mutilation (i.e. castration). Since Sima Qian did not have enough money to atone his fault, he chose the latter and was then thrown into prison. In 96 B.C.E., Sima Qian was released from prison. The three-year ordeal in prison did not frighten him away. On the contrary, it became a driving force compelling him to succeed his family’s legacy of recounting history. So he continued to write Shiji, which was finally finished in 91 B.C.E. Although the style and form of Chinese historical writings varied through the ages, Sima Qian’s Shiji has since dictated the proceeding quality and style. Not only is this due to the fact that the Chinese historical form was codified in the second dynastic history by Ban Gu’s Han Shu (“History of Han”), but historians regard Sima Qian’s work as their model, which stands as the "official format" of the history of China. 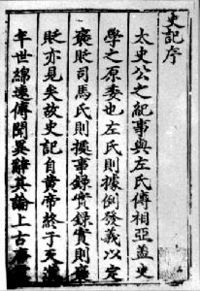 In writing Shiji, Sima Qian initiated a new writing style by presenting history in a series of biographies. His work extends over 130 chapters—not in historical sequence, but was divided into particular subjects, including annals, chronicles, treatises—on music, ceremonies, calendars, religion, economics, and extended biographies. Before Sima Qian, histories were written as dynastic history; his idea of a general history affected later historiographers like Zhengqiao in writing Tongshi and Sima Guang in writing Zizhi Tongjian. Sima Qian even affected the writing style of histories in other places, as seen in The History of Korea, which was written as a general history. Sima Qian's Shiji is respected as a model of biographical literature with high literary value. Its artistry was mainly reflected in the skillful portrayal of many distinctive characters which were based on true historical information. Sima Qian was also good at illustrating the response of the character by placing him in a sharp confrontation and letting his words and deeds speak for him. The use of conversations in his writing also makes the descriptions more vibrant and realistic. Sima Qian also initiated a new approach in writing history. The language used in Shiji was informal, humorous and full of variations. This was an innovative way of writing at that time and thus it has always been esteemed as the highest achievement of classical Chinese writing; even Lu Xun regarded Shiji as "the first and last great work by historians, poems of Qu Yuan without rhyme." Sima Qian formed his own simple, concise, fluent, and easy-to-read style. He made his own comments while recounting the historical events. In writing the biographies in Shiji, he avoided making general descriptions. Instead, he tried to catch the essence of the events and portrayed the characters concretely and thus the characters in Shiji gave the readers vivid images with strong artistic appeal. His writings were influential to Chinese writing, which become a role model for various types of prose within the neo-classical (fu gu) movement of the Tang-Song period. The great use of characterization and plotting also influenced fictional writing, including the classical short stories of the middle and late medieval period (Tang-Ming), as well as the vernacular novel of the late imperial period. Shiji still stands as a textbook for the studies of classical Chinese worldwide. Apart from Shiji, Sima Qian had written eight rhapsodies (Fu), which are compiled in Ban Gu's Hanshu. Sima Qian expressed his suffering during the Li Ling Affair and his perseverance in writing Shiji in these rhapsodies. Sima Qian analyzed the historical records and sorted out those which could serve the purpose of Shiji. He intended to find out the patterns and principles of the development of human history by writing Shiji so as to find out the relationship between heavenly law and men. This is why he adopted a new method in sorting out the historical data and a new approach in writing the historical record. Sima Qian emphasized the role of men in affecting the historical development of China. It is the first time in Chinese history that men were put under the spotlight in the analysis of historical development. He also denounced superstition by condemning Emperor Han Wudi, who was extravagant in praying to gods. In addition, he also proposed his historical perception that a country cannot escape from the fate of "from boom to trough, and from trough to boom." With these in-depth analyses and insight, Sima Qian set an example for writing journalistic articles in later generations. Unlike Ban Gu's Hanshu, which was written under the supervision of the imperial dynasty, Shiji was a privately written historiography. Although Sima Qian was the prefect of the Grand Scribes in the Han government, he refused to write Shiji as an official historiography. This is why Shiji not only covered those of high rank, but also people of the lower class so as to portray the darker side of the dynasty, and thus Shiji is regarded as a "veritable record." Sima Qian and his father, Sima Tan, were both court astrologers (taishi) in the Former Han dynasty. At that time, the astrologer was an important post, responsible for interpreting and predicting the course of government according to the influence of the Sun, Moon, and stars, as well as other phenomena like solar eclipses, earthquakes, etc. Before compiling Shiji, in 104 B.C.E., with the help of his colleagues, Sima Qian created Taichuli (which can be translated as “the first calendar”) on the basis of the Qin calendar. Taichuli was one of the most advanced calendars of the time as it stated that there were 365.25 days in a year and 29.53 days in a month. The creation of Taichuli was regarded as a revolution in the Chinese calendar tradition. Sima Qian, Xianyi Yang, and Gladys Yang. Selections from Records of the Historian. Peking: Foreign Languages Press, 1979. Watson, Burton. Ssu-ma Ch'ien: Grand Historian of China. New York: Columbia University Press, 1958. Beasley, W. G. and E. G. Pulleyblank. Historians of China and Japan. New York: Oxford University Press, 1961. All links retrieved September 19, 2015. This page was last modified on 19 September 2015, at 15:29.